Well, at last I seen to have more or less got the hang of this crochet thing, although I haven't yet finished my russian dolls - I have made all 4 but seem to have lost one of the faces! I think the embroidering of the eyes and mouth is putting me off a little, but that's the beauty of crochet - I can have several projects on the go, and pick them up as and when I am in the mood for them. 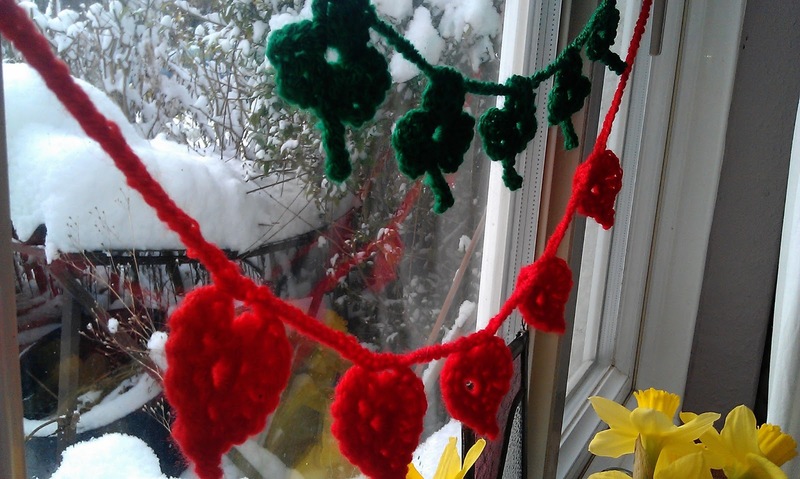 I have been particularly enthusiastic on the bunting making front, deciding that as I have Irish ancestors from the early 1800s, it would be just churlish not to celebrate St Patrick's day in an appropriate crochety way! I am rather pleased with it, and it didn't take too long. The fact that I made it at 2am in bed, is neither here nor there! 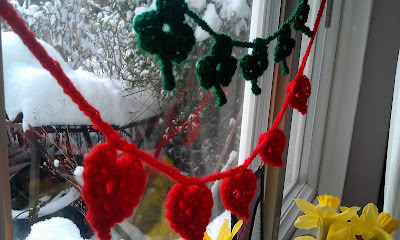 ..and in it's St Patrick's day position, along with some heart bunting. I liked the hearts so much that I just couldn't take them down! 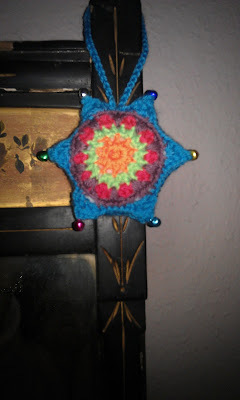 My next project was to attempt a daffodil, following a pattern written by the lovely Lucy on her blog attic 24. To be honest, I thought it was a little beyond my capabilities, so I was more than a little delighted at the result! And finally, last night I finished my first Christmas decoration of the year ....I know, it's a bit early, but sooooo pleased with it! I just hope I get the enthusiasm to make some more before December, as it did take me a stupidly long time to complete. Hope you like these and perhaps get inspired to do some hookying yourselves! Thank you for looking! I love the St Patrick's Day bunting Helen, I wonder if I've got time to hook some up before Sunday? !